The genteel ritual of afternoon tea dates back to 19th-century England, where the cream of society would sit down for a four-o-clock snack with tea to tide them over between breakfast and dinner. 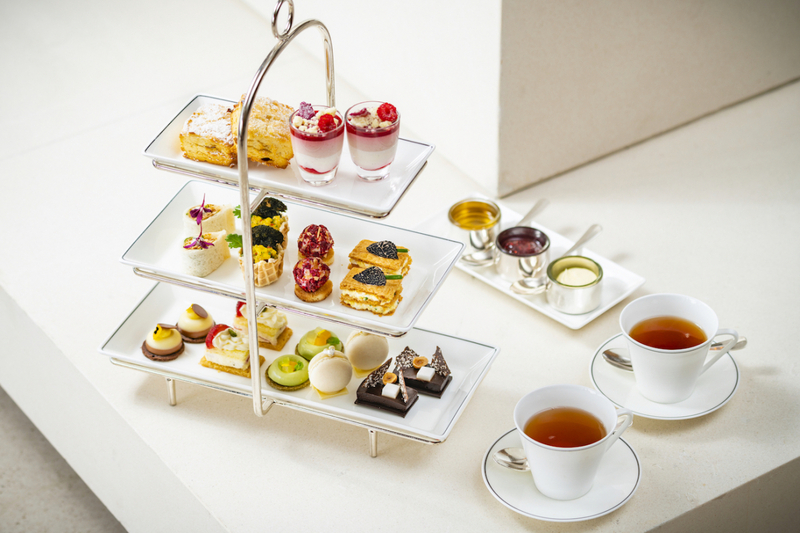 Today, we enjoy the ceremony of afternoon tea as an occasional indulgence and treat. With no shortage of options in Hong Kong — from the classic to the seasonal and contemporary — here are five spots that are just our cup of… well, you know. The Palm Court in London is said to be the birthplace of afternoon tea and here in Hong Kong, a rather special and exclusive tea set is offered to celebrate Mid-Autumn. The seasonal Twinkle in the Moonlight reflects both British and Chinese traditions; an osmanthus mooncake is made with ganache and William pears pâte de fruit coated in chocolate, while the steamed crab and cucumber tastes like an Asian adaptation and homage to British cucumber sandwiches. Warm scones with Devonshire clotted cream, strawberry jam and rose preserve are served with all sets, while the deluxe menu includes an extra sweet and chilled glass of Perrier-Jouët Champagne. HK$348 for one person and HK$598 for two; available from 1 to 30 September, on weekdays 3:00-5:30pm and weekends / public holidays 2:15-4:15pm and 4:30-6:30pm. A large slice of British charm and heritage can be found at the Timothy Oulton restaurant and bar. Starting with a sandwich selection that would likely impress Her Royal Highness, poached chicken and tarragon mayonnaise, beef with whole grain mustard and smoked Scottish salmon with crème fraiche sandwiches are served with tea or coffee in the British Afternoon Tea Experience. Homemade raisin scones arrive to the table warm, as well as sweet desserts of lemon and mascarpone mousse, chocolate orange dome cake and the beloved carrot cake with butter cream. Louis Roederer Brut Premier or Rosé can also be ordered for that added touch of opulence. HK$248 for one person and HK$488 for two; available on Saturday from 2:30 to 5:00pm. The Peninsula exudes classic grandeur and afternoon tea at this iconic hotel is nothing short of elegant. Served daily, the Classic Afternoon Tea Set is accompanied by live strings strumming classical music (except on Monday) while you sip tea from The Peninsula’s collection. Served with precision, a selection of finger sandwiches and savoury pastries as well as freshly baked raisin scones with clotted cream and organic strawberry preserve are offered. A glass of Deutz Peninsula, Brut Champagne is the icing on the cake to while away an indulgent afternoon. HK$388 for one person and HK$688 for two; available daily from 2:00 to 6:00pm. Tea, cake and a well-deserved break is just what the doctor ordered, or at least what is prescribed at Dr. Fern’s Gin Parlour. With a unique afternoon tea inspired by the Swedish tradition of “Fika” breaks, the After-Tea offers an assortment of savoury pastries and bon bons such as shrimp skagen with chilli and garlic alongside Yorkshire puddings filled with beef cheek and strawberry surprises with popping candy. Offered with coffee or a variety of organic brews such as aged pu’er, oolong and green tea, you’ll definitely want to make time for this one. HK$498 for two persons; available daily from 2:00 to 5:00pm. Afternoon tea with a million dollar view? It’s not a bad start at Café Gray Deluxe with unrivalled views over Victoria Harbour from the 49th floor, but as things couldn’t get any better, the seasonal tea set has some of the best sweets and savouries the city has to offer. Highlights include truffle and egg salad millefeuille with hojicha, milk chocolate bergamot dome and vanilla and raspberry coupe with rose petal. Don’t forget to complement your afternoon tea with Champagne if you’re after that luxurious sky-high experience. HK$310 for one person and HK$560 for two; available daily from 3:30 to 5:30pm.